I review Steve Hickner's book Animating Your Career at Cartoon Brew. A Medium? A Genre? Does it Matter? Scott Mendelson in Forbes takes a view I've long held. Animation may be a medium, but Hollywood treats it like a genre. "It can be argued, and has been argued by the likes of Brad Bird (The Iron Giant, The Incredibles, and Ratatouille) among others that one shouldn’t discuss animated films as if they are all to be lumped together, since technically the only thing they should have in common is the fact that they are not produced via live-action. I wish that were wholly true. But when it comes to discussing mainstream animated films in America, it is unfortunately a question of genre. Artistically and especially financially speaking, films like Cloudy With A Chance Of Meatballs 2 and Turbo are indeed cut from similar cloth in that they are basically targeting the same audience. We might decry this fact, but American animated films are still considered child’s play, a notion that heavily influences who they are aimed at and how they are made." Unfortunately, when we get something animated aimed at adults, it's because it's unsuitable for children, not because it should be taken seriously by anyone mature. Today's announcement of Sausage Party, an R-rated animated feature by Seth Rogen and Evan Goldberg, does nothing to advance the cause of animation for adults. We can argue over the terminology, but it doesn't change the facts. North American animation is kid stuff. I've just learned that Grant Campbell passed away from lung cancer on September 4, 2013. Grant worked in the Ottawa animation industry for several decades. He was a graduate of Sheridan College in 1981 and he worked on Rock and Rule at Nelvana in Toronto before relocating to Ottawa. His sister Kathleen would like to be in touch with those who knew him. Her email is kathleen1133(at)sympatico(dot)ca. 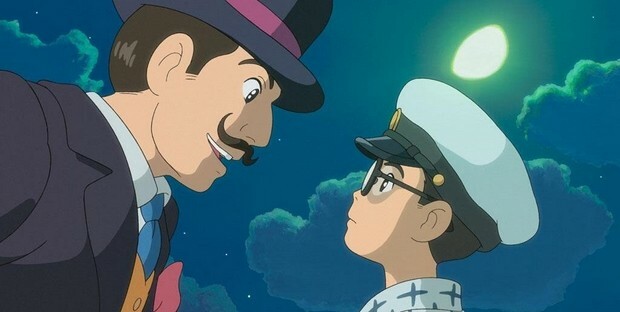 The Wind Rises, viewed at the Toronto International Film Festival, is most likely Miyazaki's last feature film. It departs from his previous work in many ways. It is a film of contemplation more than action. The fantasy elements that Miyazaki has used so effectively are present only in the main character's dreams. The dreams themselves have ties to the real world, as Jiro Hirokoshi converses with Caproni, an Italian aircraft designer that Jiro has only read about. Jiro's waking life is our world, with all its problems, and his dreams are related to his real world concerns. While flying is Jiro's ambition, he is too nearsighted to become a pilot. His compromise is to become an aeronautical engineer and design the planes that he is unable to fly. While he is interested in planes for their beauty, his work is financed by the Japanese military establishment that has other plans for the machines. 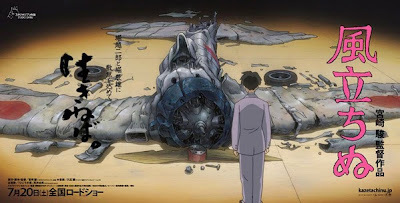 Just as Clint Eastwood's Letters from Iwo Jima is the Japanese perspective on events depicted in his movie Flags of our Fathers, Hayao Miyazaki's The Wind Rises is in some way a Japanese perspective on William Wyler's The Best Years of Our Lives. In both films, ordinary people pursue their goals but are caught up in World War II. 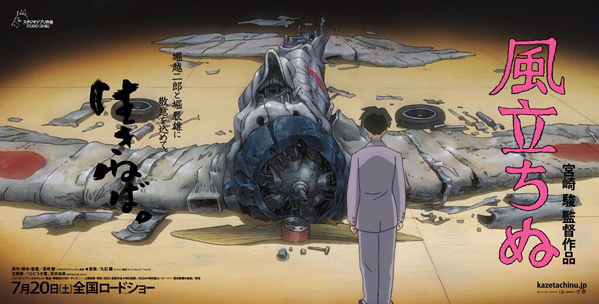 Both films have a similar image near their conclusions: a graveyard of ruined aircraft. Two events early in the film are the story in miniature. The first is the Tokyo earthquake and fire of 1923. While a disaster overall, it prompts heroic action and the rebirth of the city. Then there is Caproni's dream plane, built after World War I, which crashes on its test flight. The first disaster is beyond human control and the second is the result of human failure. In each case, there is disappointment and tragedy, yet people persevere and continue to pursue their goals. In a dream, Caproni asks Jiro if he would prefer a world with or without pyramids. The implication is that their construction created both human suffering and beauty. Both Jiro and Caproni prefer a world with pyramids, a statement that creation is worth suffering for. As the earthquake shows, there will be suffering in any case, creation or no. The Wind Rises is both profoundly realistic, unafraid to recognize the disasters and suffering (both natural and man-made) that people must endure, and also profoundly optimistic, in that people continue to follow dreams despite their troubles. It is a film made by an old man, one who understands that there are no unequivocal happy endings. Tragedy and disappointment are inevitable in each life. The pursuit of creating something beautiful stands in opposition to that, the only thing that elevates people beyond mere survival. It is not a film for children, not because there is anything objectionable in it but because I suspect it would bore most children. 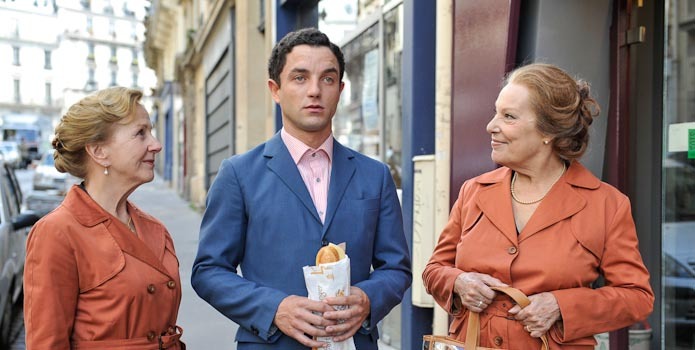 The film is about adult concerns: the workplace, marriage, politics and death. I'm curious as to why Disney has decided to distribute this film and also curious as to how they will market it. Given how hard they worked to shield children from seeing Pecos Bill smoking, Disney can't be happy that several characters in The Wind Rises are chain smokers. Advertising this as "from the director of Spirited Away" may be literally true but will not represent this film accurately to the family audience. I doubt it's going to appeal much to weekend moviegoers at the mall as this is not what general audiences have been trained to expect from animated entertainment. Miyazaki has broken new ground for himself here, stepping away from fantasy to offer a perspective on Japan's past and the value of creativity to human existence. This film will not please all his fans but he knew that this film would be his final statement. He chose to address his society about the things that he values and those he disdains. 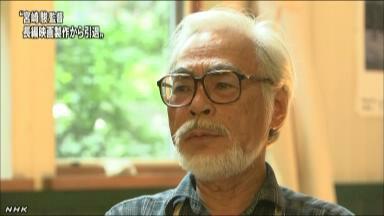 That the film has provoked some controversy in Japan is evidence of Miyazaki's decision to take risks. I don't know if I'd consider the film a masterpiece. Is it as good as Princess Mononoke, Spirited Away or Ponyo? I'll need more viewings to solidify my thoughts. However, it is an important film, both as part of Miyazaki's body of work and as another advance for mature animated films. Miyazaki's retirement, while inevitable, is a tragedy for animation as a whole. His exit will leave a gaping hole in the animation landscape. We've been blessed to have so many films from him and his compatriots at Studio Ghibli. The Wind Rises might not be Miyazaki's best film, but it might be his most important. Sylvain Chomet, director of The Triplets of Belleville and The Illusionist premieres his first live action feature, Attila Marcel, at the Toronto International Film Festival on Sept. 6. The above quotes come from an article in the L.A. Times. Toronto's two weeklies, Now and The Grid, both review the film in advance and find it lacking. Studio Ghibli production company has announced that the master of animated film known in the world , Hayao Miyazaki to retire supervision.Miyazaki is with a press conference in Tokyo on the 6th this month , and that talk and reason of retirement. Koji Hoshino is president of Studio Ghibli , held a press conference at the Venice Film Festival in Italy , which has been nominated the " Tachinu Wind" movie , this was revealed. The said, " Hayao Miyazaki has decided to retire supervision last " Tachinu " wind " and, Hoshino president has announced that it will withdraw the director in this.Miyazaki 72 -year-old from Tokyo. It becomes animator after graduating from college , and has been expanding the area of representation of the animated film in a unique view of the world and delicate movement. Successive box office film was screened in Japan, "Spirited Away," which is known for its hit "My Neighbor Totoro" and " Nausicaa of the Valley of the Wind," and "Princess Mononoke", was published in 2001, among others the number 1 in the revenue, the record is not broken now. "Spirited Away" such as winning animated feature film award of the Academy Award in the United States, received a high reputation abroad, from the achievement of these many years, last year, Miyazaki has been elected a cultural contributor. Retirement announcement of supervision work is nominated in the three major film festivals the world is exceptional. In feature films first time in five years since "Ponyo on the Cliff by the Sea " which was published in 2008, therefore, Horikoshi Jiro, who hit the design fighter of the Imperial Japanese Army "Zero fighter" and "Tachinu Wind" movie it is the work which in the model, depicting the figure of a man who lived hard, such as war or earthquake, the difficult times. In this, including the latest, in July this year, Miyazaki, feature film that Miyazaki made ​​it . Feature that you 've worked hard so as not to disturb the physical condition because there is no "daily time for an interview with NHK I've been," said has been doing think of it is, 's last work at any time. Miyazaki is that you talk about as the reason of the retired press conference in Tokyo on the 6th this month.